For those of you who have lost a child this year, our hearts are extremely heavy for you this upcoming Mother’s Day. What has historically been a day of celebration, has changed for you this year. 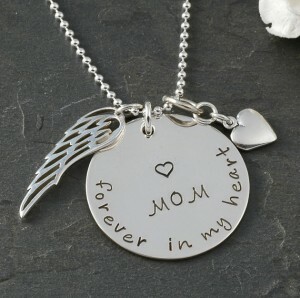 To recognize your pain and to bring a little bit of memorial happiness to you this Mother’s Day 2013, we are holding a drawing to give away one of the above Bereavement Necklaces (your choice). If you currently have a Facebook account, simply “like” our page Remember Me and message us with the name of your child (please type Child – (name) in the message box). You will automatically be entered into our drawing to be held on Saturday, May 11, 2013. Realizing that we are unable to offer this necklace to everyone (how we wish we could), you will qualify for a free timeline facebook cover for you to display on your page for Mother’s Day. Your timeline cover will be posted on our page also on Saturday. If you do not have a Facebook account, you are not forgotten. 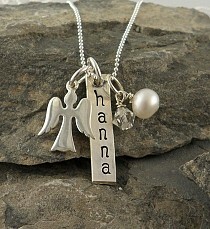 Simply contact us with your child’s name, and you will be entered into the drawing. We continue to care deeply for those who are grieving. As always, if we can do anything to help you during the grieving process, please reach out to us. *** EVEN THOUGH THIS CONTEST IS OVER, WE STILL WOULD LOVE TO DESIGN A CUSTOM FACEBOOK TIMELINE COVER FOR YOU! Remember Me Gift Boutique recognizes that Mother’s Day might not be a day of celebration for some of you. The loss of a mother can certainly bring some sadness on this day. We would like to do what we can to help you get through Mother’s Day this year – “Because We Care”. 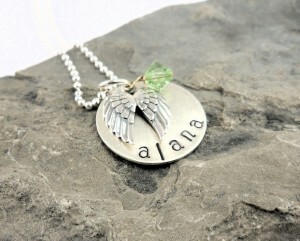 This beautiful, Hand Stamped Bereavement Necklace will be given away this Mother’s Day, 2013. We offer two ways to enter this giveaway. If you do not have a facebook account, please just contact us with the name of your Mother and you will also be added to our drawing. We truly do care for those of you who are grieving. As always, please let us know if there is anything we can do to help you during the grieving process.